In Mobility Management, Mobility-as-a-Service means total control over devices and user patterns while reducing costs by adopting standards and procedures for effectively managing your wireless service and expenses. Mobility-as-a-Service goes beyond software tools to help you organize your workforce. Mobility management along with Mobility-as-a-Service simplifies mobility rollouts and supports ongoing management . To uncover the most savings on an ongoing basis, it is important to partner with an experienced mobility management provider that offers a full range of proven services, including Enterprise Mobility Management. 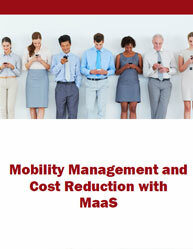 This white paper on “Mobility Management and Cost Reduction with MaaS,” addresses the following key questions: What are the most important services your Mobility-as-a-Service provider must offer? How can you securely manage smart phones and tablets with a complete enterprise mobility management platform? What kind of benefits Mobility-as-a-Service provides to the users, businesses and the public sector? How Mobility-as-a-Service progress can be achieved, using the various steps identified by mobility management? What are the things to consider when selecting an Effective MasS Partner? With mobility re-defining our lives like never before, it is evident that organizations are analyzing, evaluating and adopting key enterprise mobile deployment strategies to gain a competitive edge in the market, without disrupting their existing technological landscapes. Some of the key challenges that are grabbing the CIOs' attention in the wake of the mobile application demand are: How to meet business demand for mobile app deployment services and solutions with existing IT resources How to keep mobile devices safe from data breaches and thefts How to keep up with the rapid upgrade cycles and diverse device platforms without extensive investments. 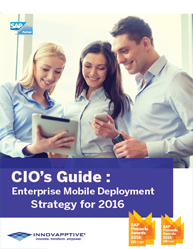 This CIO’s guide to mobile deployment explores certain key strategies associated with the easy deployment of mobile solutions, managing day to day support and upgrade cycles, mobile device management, mobile security and above all helps in strategizing your organization to gain a competitive advantage with the increasing pervasiveness of enterprise mobility.